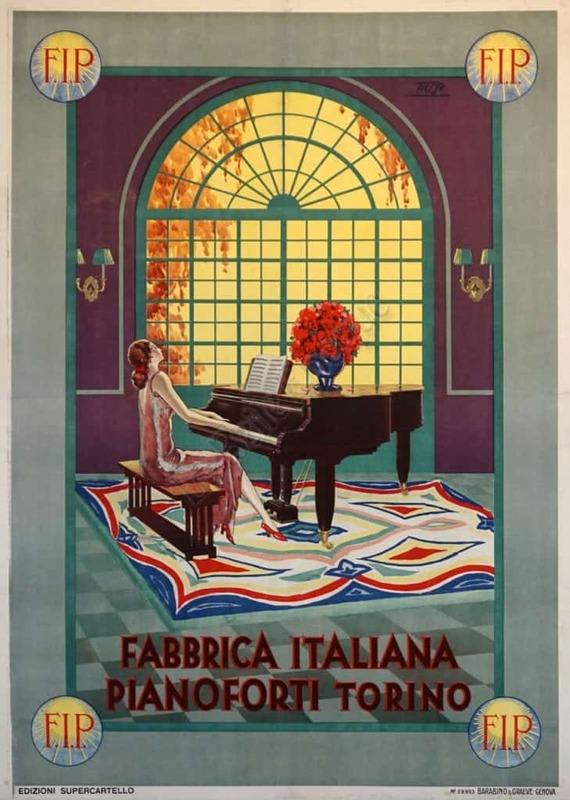 This classical Italian Art Nouveau piece, advertising a piano maker, depicts a luxuriously dressed woman, costumed in the classical 1920s flapper style, playing the piano. She is playing in a sumptuously decorated living room, framed by a large arched window which looks out onto a blindly golden exterior. The interior of the scene is dominated by a rich color scheme, with the deep crimson of the walls subtly playing with the plush emerald greens of the trim and the carpeting, and the rug under the piano providing a counterpoint of blue, orange, and white. The piece is an excellent example of way that the Italian Art Nouveau played with color, line, and illusive geometric patterns. This original poster was printed by Barabino & Graeve, Genova. The image begins three quarters of an inch from the edge.